While donuts may not be the first thing you think of when you think of summer, Krispy Kreme aims to change that and we’re 100% on board. 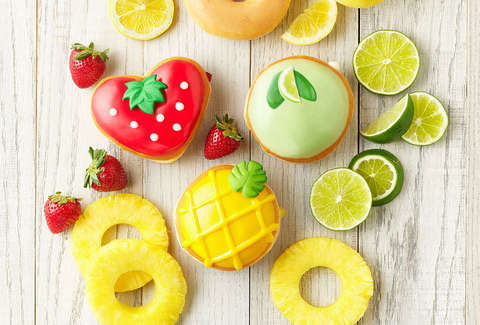 The purveyor of fried sugary dough is bringing back its super-popular Lemon Glazed donut for a limited time and releasing three fruity, summer-y donuts in May that’ll perfectly complement your summer Fridays. Lemon glaze is returning to Krispy Kreme Monday, April 22, a spokesperson said, but it won’t be around long. The donut giant will carry this tart treat for one week only. Fear not, however, as Krispy Kreme is filling the donut-shaped void in your heart with three new fruity donut flavors just in time for summer. Starting Monday, May 6, Krispy Kreme shops will be offering up pineapple, strawberry, and key lime donuts. “Winter? No. Summer is coming. Come in and get an early taste today,” Dave Skena, chief marketing officer at Krispy Kreme, said in a statement. No rush to grab one, or all three, of these tasty treats. They’ll be hangin’ around from May 6 until June 16 at participating Krispy Kreme stores across the US. Grab one the day they release, or maybe to celebrate your first day of getting out of work early to soak up the beautiful weather.